Lender: Aetna Life & Casualty Co. 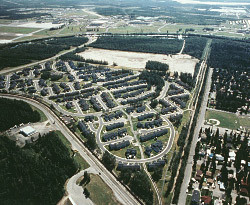 Features: Birchwood was designed to provide an attractive, high-quality living place for families within the unique environment of Fairbanks. Large open landscaped grounds, outdoor adults recreational facilities, and 17 tot lots enable tenants to enjoy the long, sunlit days of summer months. Interiors are also designed with play spaces for children and flexible living/dining areas to accomodate greater indoor needs during the winter. Uniquely, these homes are exceptionally well insulated, with 12 inches of insulation in the walls and 24 inches in the ceilings.